I promised previously that I would discuss Hannah Friedman and colleagues’ paper, “Fragments of an early Islamic Arabic papyrus from Khirbet Hamrā Ifdān” — published in the same issue of Arabian Archaeology and Epigraphy as our paper on Khirbat al-Manā’iyya — in more detail. Since then I’ve been distracted by several projects (more on which soon eventually), but wanted to return to this paper, as their conclusions are relevant to some of the points I make about Khirbat Hamra Ifdan (KHI) in my dissertation, and the find itself is quite fascinating. The key find discussed in the paper is, as the title suggests, a poorly preserved four line papyrus fragment with an Arabic inscription. There isn’t much to say about the content of the inscription, because it’s quite fragmentary, with only one complete word preserved: “Allah.” (Given the content, it’s worth noting that I don’t find their suggestion that “it is highly probable” the author of this text was a Muslim [Friedman, et al. 2017: 291] compelling, for reasons I’ll discuss below.) On paleographic grounds, they date the inscription to somewhere between the late 7th and mid-8th centuries AD. I am not, by any stretch of the imagination, a papyrologist, so I can’t comment on their paleographic arguments, but I can comment on the archaeological context. They were working in the northern portion of KHI, to the north of the large Early Bronze Age settlement that makes up the most famous component of the site. By contrast, my work with ELRAP has concentrated on the southern portion of the site. The primary feature relevant to the discussion here is Area L, a large square structure excavated in 2000 and, unfortunately, still essentially unpublished (I’m working on it, though). It was identified at the time as a caravanserai, but I think it’s more likely to be a farmhouse reusing portions of an earlier Roman tower, a point I discuss in my reevaluation of this material in my dissertation (the papyrus fragment doesn’t necessarily point to one identification over the other). 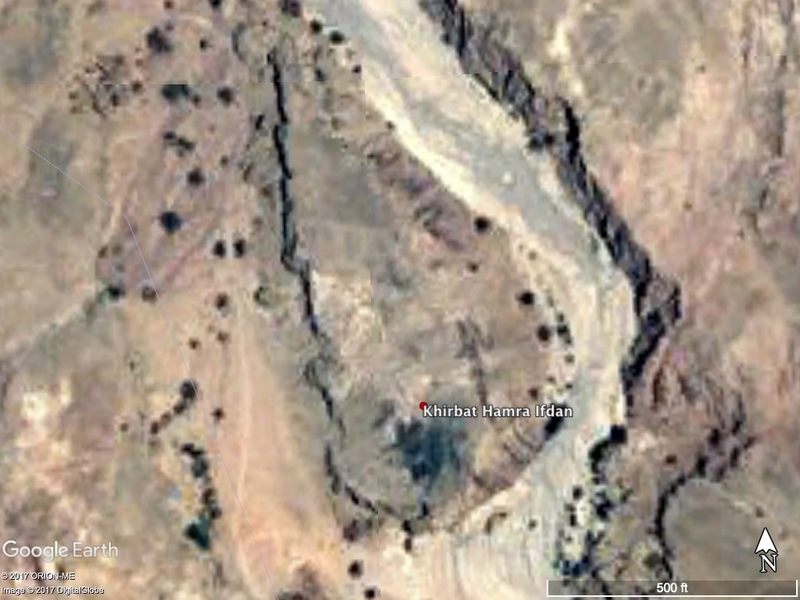 In Figure 1 (the image quality for this portion of Wadi Fidan in Google Earth is unfortunately rather bad), the black patch south of the red pin is Area E, a copper slag mound dating primarily to the Iron Age II, and the square structure barely visible to the north of the pin is Area L.
Figure 1: Google Earth image of Khirbat Hamra Ifdan. Later in the paper, Friedman, et al. discuss the broader Faynan region, and particularly Khirbat Faynan, a large site in the eastern portion of the Wadi Fidan/Faynan system. Khirbat Faynan was the Roman and Byzantine town of Phaino, site of an imperial metallum, and was certainly occupied into the Early Islamic period. In general I think this discussion is sensible, but one part of it took me by surprise. On pp. 291-292, Friedman, et al. state that “Khirbat Faynān … has never been excavated.” Part of why this surprised me so much is that the citation following this statement includes “Jones et al., 2014: 184,” where I make reference to the ELRAP excavations at Khirbat Faynan. In fact, as shown in Figure 2, ELRAP conducted excavations in 2011 and 2012 in three areas of the site. You can even make out the step trench we excavated in 2011 in Area 16 on the satellite imagery (the portion to the left of the “Area 16” pin is particularly easy to make out). In fairness to Friedman and colleagues, these excavations are not as well published as they should be. I do, however, refer to them in our 2014 chapter, and the 2011 excavations are discussed in a paper in the Annual of the Department of Antiquities of Jordan, a scan of which is available here. The ADAJ paper only discusses earlier occupations at Khirbat Faynan, but even without the Early Islamic area we excavated in 2012 — Area 18 — it would be incorrect to say the site had never been excavated. Nonetheless, Friedman and colleagues correctly note that the site continued to be occupied into at least the later 8th century. This is basically consistent with the dating of the Early Islamic phases in Area 18, although the latest of these contained several forms that continue into the 9th century, as well. The Islamization of Faynan: An Early Islamic Mosque in Wadi Fidan? I should now return to the point I brought up above concerning the religious identity of the author of the inscription, which isn’t the critical point of the paper, but is the major point I disagree with. Friedman, et al. (2017: 291) point out that the content of the inscription does not actually point to an identification of the author as a Muslim. As the Arabic word for “God,” “Allah” appears in Arabic Christian texts of this period (and later, of course), as well. Friedman, et al. provide some examples, to which more could certainly be added. Nonetheless, they also think it is “highly probable” that the author was a Muslim, apparently on the basis of the archaeology of the site. What about the archaeology makes them say this? On pp. 285-286, Friedman and colleagues note that one of the authors, Russell Adams, visited the site in the mid-1980s as part of Burton MacDonald’s Southern Ghors and Northeast ‘Arabah Archaeological Survey (SGNAS) and observed a structure that looked like an open-air mosque, but with its mihrab facing Jerusalem, rather than Mecca. They go on to say that when he and my advisor, Tom Levy, began excavating the site in 1999, the structure was gone. It’s unclear what this structure is, as it was apparently never mapped. I would note, however, that this sounds rather like a structure visible on a map of the excavations published by Levy, et al. (2002: 434, Fig. 5A), which was assigned to site Stratum II, dating to the Early Bronze Age IV. This isn’t an exact match (the “mihrab” faces slightly northeast, more or less toward Damascus, rather than Jerusalem), but it’s pretty darn close, considering the reconstruction is based on memory. Friedman and colleagues, rightly, don’t seem to regard this as evidence that there was a mosque on the site. It is perhaps also worth noting WFD 105, published by Levy, et al. (2001: 176, Table 2) as an Islamic period cultic site. If that identification is correct, it would also be quite odd, as that structure oriented to the west, rather than the south. (To this discussion we could also add FJHP Site 136, a structure near Petra with a niche in its eastern wall [Kouki 2013].) The discussion of whether these structures, particularly FJHP Site 136, could be mosques revolves to a large extent around the mosque or musalla built of copper slag at Be’er Ora, which seems to have niches in its eastern and southern walls, although the eastern one is less clear. I don’t really want to get into this in much detail. The key facts are that this mosque was suggested to have an east-facing mihrab later converted to a south-facing one, and that the excavations did not actually produce evidence that would support (or, to be fair, rule out) this claim (Sharon, et al. 1996). In short, there isn’t a lot to go on here. It’s not possible to rule out the possibility that WFD 105, FJHP 136, or the now-missing structure at KHI could have been mosques, but that isn’t the same as being able to say they are. Back to the point. Why do Friedman, et al. think the author of the papyrus was likely Muslim? The beginning of their discussion is not promising: “Archaeological suggestions of an early Islamic mosque at KHI dating to the seventh or eighth century are supported by the find of the papyrus” (Friedman, et al. 2017: 292). This is, of course, circular reasoning. The papyrus is likely to have been written by a Muslim if there is a mosque at the site, which in turn is likely if there’s a papyrus written by a Muslim at the site. I’ll return to this briefly, but first let me lay out the rest of their argument. They first suggest the “Negev desert mosques” as a model, and place the hypothetical mosque near ‘Ayn Fidan, the spring to the south of the site. In the next paragraph, they suggest that “structures surrounding the missing mosque functioned as a venue for economic or social purposes,” citing the farmstead at ‘En ‘Avrona (in the southern Wadi ‘Araba, near ‘Aqaba) as a parallel (Friedman, et al. 2017: 292). I don’t think both of these models should be applied to the same site, and I would suggest that ‘En ‘Avrona, Nahal La’ana (Nahlieli, et al. 1996] and a number of other sites — which have rooms that served as mosques inside structures that look rather like KHI Area L — are probably a closer parallel to KHI than the hilltop Negev mosques. In other words, further excavation in Area L could probably tell us whether there is a mosque at the site or not. Which brings us back to their initial reasoning. The idea that there should be a mosque at the site assumes more about the Islamization of Faynan than we actually know. What we can presently say is that the region continued to be occupied well into the Early Islamic period. That doesn’t, however, tell us much about the religious identity of the people living there. One can assume that these people were either early converts or Muslim newcomers to the region, but at our present state of knowledge, this is an assumption. Looking to Petra rather than the Negev may caution against this, as excavations at Khirbat al-Nawafla in Wadi Musa demonstrated that the population was either primarily Christian or confessionally-mixed into at least the late 8th century, and probably rather later (‘Amr, et al. 2000). It’s also possible that KHI and Khirbat Faynan don’t follow the same pattern. Further excavation could very well find a mosque at KHI and continued use of churches at Khirbat Faynan. Presently, we simply don’t know. That said, however, I should reiterate that this is a really incredible find, and I’m definitely looking forward to hearing about the rest of the material they’ve found. 2000 Summary Results of the Archaeological Project at Khirbat an-Nawāfla/Wādī Mūsā. Annual of the Department of Antiquities of Jordan 44:231-255. 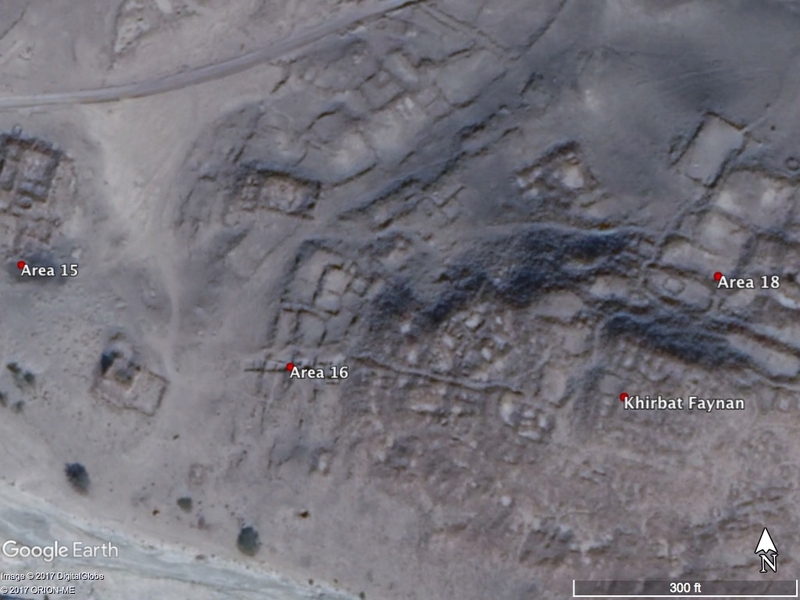 2014 “Not Found in the Order of History”: Toward a “Medieval” Archaeology of Southern Jordan. In From West to East: Current Approaches to Medieval Archaeology. S.D. Stull, ed. Pp. 171-206. Newcastle-upon-Tyne: Cambridge Scholars. 2018 The Arabah Copper Industry in the Islamic Period: Views from Faynan and Timna. In Mining for Ancient Copper: Essays in Memory of Beno Rothenberg. E. Ben-Yosef, ed. Pp. 332-342. Tel Aviv University Sonia and Marco Nadler Institute of Archaeology Monograph Series, Vol. 37. Winona Lake, IN and Tel Aviv: Eisenbrauns and Emery and Claire Yass Publications in Archaeology. 2013 Site 136, an Open Mosque? In Petra — The Mountain of Aaron: The Finnish Archaeological Project in Jordan, Volume III: The Archaeological Survey. P. Kouki and M. Lavento, eds. Pp. 317-321. Helsinki: Societas Scientiarum Fennica. 2002 Early Bronze Age metallurgy: a newly discovered copper manufactory in southern Jordan. Antiquity 76:425-437. 2001 Early Metallurgy, Interaction, and Social Change: The Jabal Ḥamrat Fīdān (Jordan) Research Design and 1998 Archaeological Survey: Preliminary Report. Annual of the Department of Antiquities of Jordan 45:159-187. 2012 The 2011 Edom Lowlands Regional Archaeology Project (ELRAP): Excavations and Surveys in the Faynān Copper Ore District, Jordan. Annual of the Department of Antiquities of Jordan 56:423-445. 1992 The Southern Ghors and Northeast ‘Arabah Archaeological Survey. Dorchester: The Dorset Press. 1996 The Nahal La’ana Site: An Early Islamic Farm in the Negev. ‘Atiqot 30:67*-78*, 130. 1996 An Early Islamic Mosque near Be’er Ora in the Southern Negev: Possible Evidence for an Early Eastern Qiblah? ‘Atiqot 30:107-114.